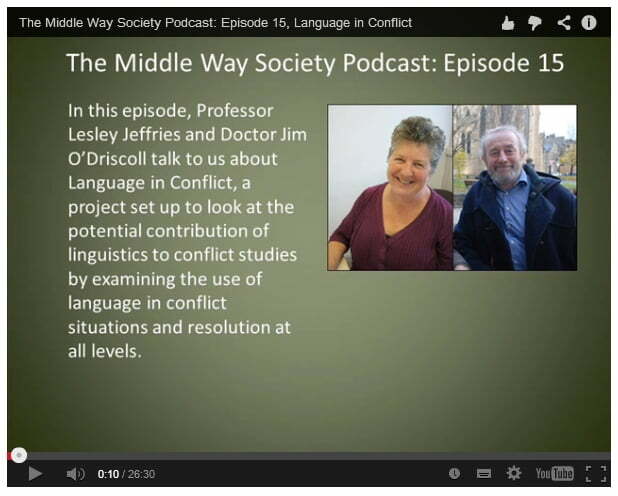 Language in Conflict's Lesley Jeffries and Jim O'Driscoll recently made an appearance on the Middle Way Society's own podcast. The Middle Way Society was formed to support the study and promotion of the idea of the Middle Way — an attempt to help us make better judgements by recognising the fixed beliefs that we hold. 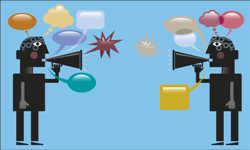 Click the picture below to hear Lesley and Jim talk to MWS's Barry Daniel about Language in Conflict and the use of language in conflict situations and attempts at conflict resolution. They describe in detail the work we have been doing with mediators across the UK. Also, the podcast is available in audio-only from the Middle Way Society's page dedicated to this episode of their fascinating podcast series.